SAN FRANCISCO — The jet fighters raced across the sky maybe 500 feet above me. They were F-18s painted blue and yellow – the U.S. Navy’s Blue Angels aerobatics team. They raced across San Francisco Bay last Thursday, alone and in pairs, splitting and diving and rolling and occasionally forming into up into four-ship diamonds so tightly packed it looked like a person could step from plane to plane. The jets were practicing for an air show so the Navy could show off what it considers the very best in personnel, training and equipment. Their presence over the old Treasure Island Naval Station that day was ironic, because I was visiting the island to see the Navy at its most decrepit and toxic. 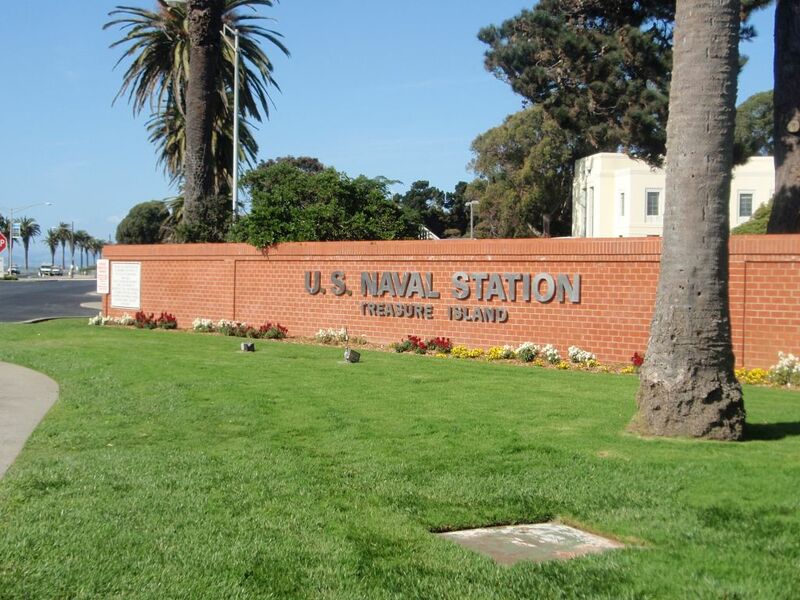 Turns out that old Treasure Island Naval Station is some of the hottest property in San Francisco. Maybe the hottest, in fact, though not in the way reuse officials, politicians and land developers want to admit. That’s because a disputed portion of Treasure Island – the Navy says just a few sites, others say possibly the entire island – is radioactive. 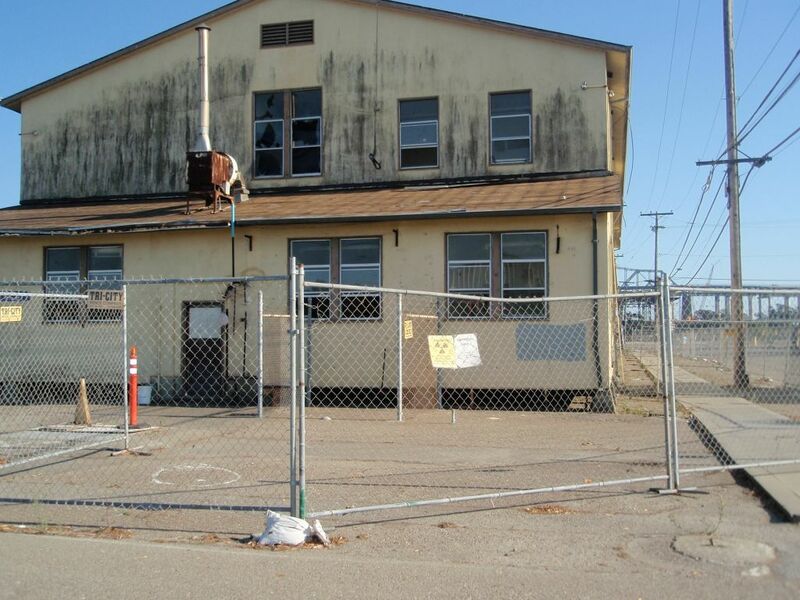 What to do about the radiological contamination has become the great unmentionable in the quest to turn the old, rapidly decaying base into San Francisco’s “premier date-night locale,” as one aide to Mayor (and Lieutenant Governor candidate) Gavin Newsom recently put it. 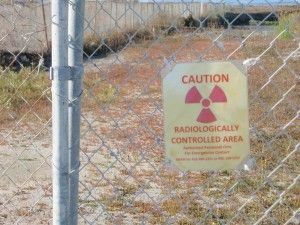 The extent of the danger posed by what lay behind the fences and radiation hazard signs isn’t something the Navy likes to talk about. At public hearings of the Restoration Advisory Board (RAB) – a citizens panel that observes all base cleanup efforts, but takes no action – Navy officials and contractors go to great lengths to say all is well, that there are only a few radioactive sites on the island, and cleanup efforts are proceeding at pace, even though the Navy is well behind schedule. And yet after I made two phone calls to the Defense Department’s Base Closure and Realignment Commission (which the Defense Department inexplicably condenses into the acronym BRAC) — the office that handles all base reuse issues — asking for the status of the radiological cleanup, all I received was a terse, dismissive statement by e-mail. Others, one of whom agreed to speak anonymously because the person is not authorized to talk to the press, said something very different. Visitors to the man-made, 403-acre island these days see nothing but charm and opportunity at the entrance. There, palm trees sway over a marina, snack bar and an old art deco administration building that doubled for Berlin Airport in the movie Indiana Jones and the Last Crusade. Banners proclaiming “Treasure Island: Your Recreation Destination” flutter in the breeze. The city of San Francisco has big, $6 billion plans for TI. A 60-story high-rise. Swanky hotels. Eight thousand new housing units and condos – some for low-income residents, but many for the upper tax brackets. Gorgeous parks, too. At a ceremony in August, Mayor Newsom called it “arguably the most environmentally friendly infill development in American history.” (Newsom’s office didn’t respond to a request for comment for this story). For San Francisco, the future of Treasure Island looks a lot like its very distant past. The island didn’t exist before 1936. That’s when the federal Works Progress Administration (WPA) began dumping 30 million cubic yards of fill into the waters just north of Yerba Buena Island. The island’s original purpose was to house the 1939 Golden Gate International Exposition, a kind of world’s fair. After the fair there was talk of paving it over entirely and turning it into San Francisco Airport, but that proved to be just talk. In 1941, the Navy took over the island as part of America’s massive war mobilization. They held it until 1997, when it closed as part of the Pentagon’s base closure efforts to save money. During the five decades the Navy controlled the base, they used it for a variety of tasks – most notably, for the purposes of this story, as a training center for nuclear decontamination. 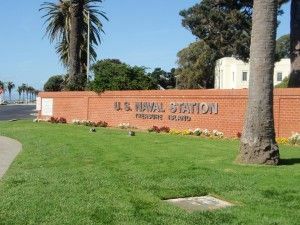 That began in 1947, according to the Navy’s 250-page Treasure Island Naval Station Historical Radiological Assessment, released in February 2006. This was a time of nuclear bomb tests in the Pacific, and the Navy needed to clean its target ships before it could study them. All wars, it seemed in these early days of the Cold War, were going to be atomic wars, and the Navy needed to know how to operate in such environments. According to Nathan Brennan, a member of the Treasure Island RAB, part of the training involved the hiding of radioactive buttons around the training school, and then students armed with Geiger counters would try to find them. At first, things seemed to go well. But then in January 1950 (the Assessment does not give the exact date), someone spilled 40 milligrams of radium in a first-floor lab of Building 233. Cleanup of the building, which was done to the far less stringent standards of 1950, took about six months. Of course, that was 60 years ago. 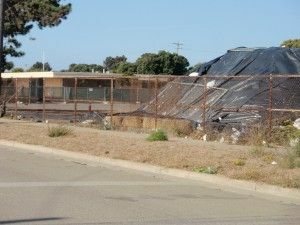 “Any radionuclide that could have decayed through 10 half-lives since its time of use at NAVSTA TI is no longer considered a radionuclide of concern,” the Assessment helpfully notes. But then there’s the Assessment’s table of “Radionuclides of Concern,” which lists 14 isotopes, including Cesium-137, Thorium-232, Radium-226, Strontium-90 and the ever-popular Plutonium-239, that all made an appearance at one time or another on the Treasure Island base. These isotopes, some with half-lives in excess of a thousand years, are all still a big concern. Redevelopment officials and contractors have a lot of work ahead of them. Throughout much of TI, buildings that look like they date to the Roosevelt Administration stand shuttered and crumbling. Asbestos signs are everywhere. On the island’s northwest corner, where streets named for fish intersect avenues named after letters of the alphabet, there are 600 low-income homes, packed with cars, people and – on the day I visited – at least three San Francisco police cruisers. This was what the Navy calls Site 12. Before the twisting streets and cramped houses went in the 1960s, this area held a lot of dump sites – and the sailors weren’t too discriminating about what they tossed here. At the last RAB meeting, held Aug. 17 on the island, a woman stood up and asked BRAC Environmental Coordinator Sullivan if it was true that the Navy had agreed that if they did indeed get radioactive hits in Site 12, then they would screen all of the island’s other debris sites. To the source close to the cleanup, this pointed to an ominous reality. “Everywhere they’ve looked for RAD, they’ve found RAD,” the source said. One of the new sites the Navy is looking at is called Site 31. But before we get there, let’s look at some of the other agencies overseeing the TI cleanup. Two of them in particular, the California Department of Public Health (CDPH) and the California Department of Toxic Substances Control (DTSC), have been, well, skeptical of the work so far. “To say that they’ve been skeptical is an understatement,” the source close to the cleanup told me. CDPH Spokesman Ron Owens didn’t return a phone call asking for comment for this story. And the DTSC provided only a boilerplate e-mailed response to my inquiry about their view of the cleanup. I thought of this thoroughly unhelpful answer to my question as I visited Site 31, which is near the center of the island. It’s a big field – next to an elementary school, of all things – and contains immense piles of dirt, some covered with black tarps, others not. “Hazardous Waste Exclusion Zone” read a large sign on the fence surrounding the field. There are, as yet, no radiation signs there. 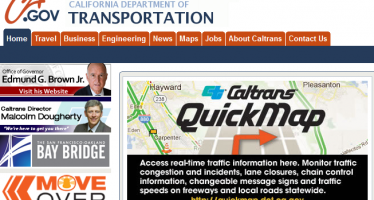 CDPH and DTSC officials know there’s trouble here. 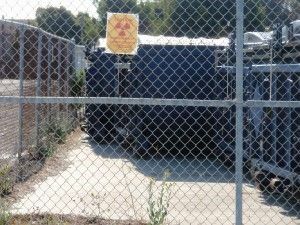 They may not be willing to talk to me about it, but according to the minutes of the Sept. 1 BRAC Cleanup Team meeting – which was not open to the public – they’re the only ones really asking questions about radiological contamination. And so on. Then the discussion moved to Site 6, which is a storage yard for large blue dumpsters that house radioactive debris before it’s shipped off island and out of state. There, radiation hazard signs hang all over the surrounding fence. So far, cleanup crews have filled 705 of these “bins” and shipped them to Clive, Utah, one of only two landfills in the country that dispose of low-level radioactive waste. It’s still standing, with interior walls splattered with graffiti drawn by homeless guys who’d lived in the abandoned building in the years between Navy control and the current cleanup effort. 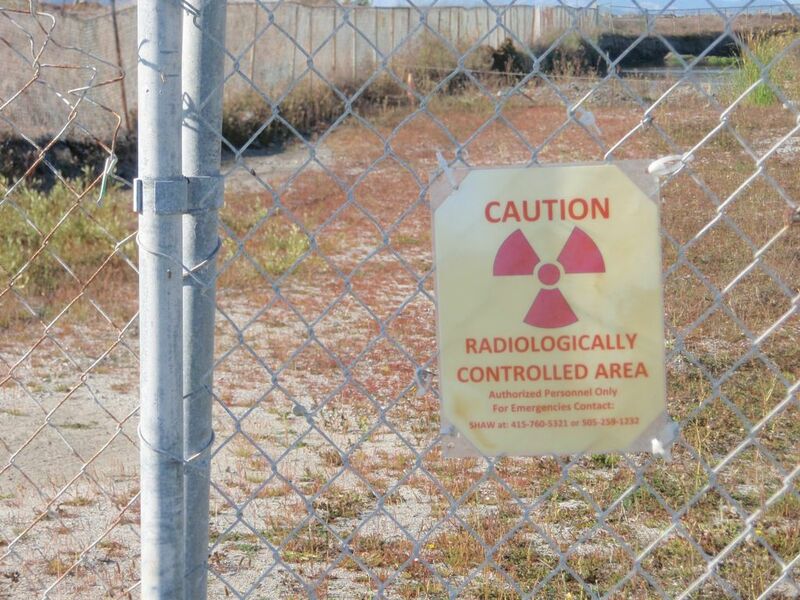 The building’s fenced in and covered in radiation warning signs. Across the street is a little league baseball field. A few minutes later Taibi of CDPH went back to the issue of what lies beneath Building 233. “Mr. Taibi reiterated the lack of detail in the work plan concerning how the building would be razed caused concern about the soil underneath the building,” state the minutes. Konzen of the Navy then referred Taibi to part of the “Accident Prevention Plan” that deals with the demolition procedure. The minutes show that Taibi “was able to locate the document,” and that the matter apparently ended there. There was talk a few years ago of giving the island to the city for free, but like the old plans to build an airport there, it went nowhere. The city eventually agreed to pay $105 million for it – a bargain, in any case. That means the cleanup has to finish. Considering its importance to the grand plans trumpeted by Newsom et al, it’s strange that the media is largely ignoring the issue. Indeed, the San Francisco Chronicle ran two stories on Treasure Island in August, neither of which even mentioned radiological contamination. Ditto an Oct. 9 story that ran on CBS 13. Another well researched story by Pignataro. What a sickening and complicated situation. Politics, money & the health of the land & human beings. Why is it that the first two seem to always trump the latter? I hope that this story, along with others on the subject enrage the community enough for a suitable resolution to this dilemma. Is there one? I know I’m not happy to be reading of this. I spent two years as a Corpsman in the clinic there in ’85 & ’86. When a Vet developes problems from the radiation or asbestos, the Government will deny any responsibility. I too was stationed on TI, and I also have health issues that can be linked to radiation exposure. What can we do? Was on TI this weekend and saw the radiation warning signs. Did a bit of searching and found this incredibly well researched article. Thank you very much, and I hope the situation imrpoves. I have been on a pontiff for years now attempting to get anyone’s attention to the health issues casued by the radioactive waste of Treasure Island. Some many friends have or had cancer, along with other life threathing illness, myself included. I have lost many friends whom I had grown up with due to the disregard for human life by the Navy.  I contacted the news agencies in San Francisco but to no avail. When will someone bring this to the general publics attention! 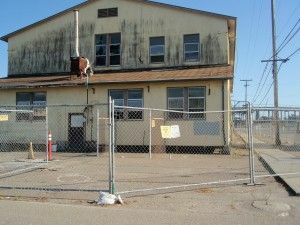 Afraid of losing millions on the projected future plans for Treasure Island, or more fearful of the potential lawsuits? Thank you, Anthony Pignataro, for this important article. But I would have liked more attention drawn to the fact that the school on Treasure Island, called SIA-Tech (School for Integrated Academics and Technologies), not just an elementary school but a vocational high school as well, is packed with kids, most of whom are from troubled homes and/or have had difficulty finishing school on time — and most of whom live on Treasure Island. And there are all the teachers / administrators who work in the school on Treasure Island — I would like to hear whether it is advised that all of them leave now — ? Could you gather together some educated guesses about just how dangerous is it for these students and teachers to live and/or work at SIA-Tech School on Teasure Island? Also – as part of the “vocational education” at the school on Treasure Island, the culinary training division has now planted a “Michelle Obama Garden,” located literally right next to those enormous piles pictured in your article (the ones covered with black plastic tarps – although some are not covered at all) — and that last fall (2011) the students harvested vegetables from the garden and served them in the school cafeteria. ??!! Applied for Veterans Compensation Benefits due to service on TI during early 70’s, related to exposures to above articles information. I have Chron’s Disease, Graves Disease, heart problems, glaucoma, skin problems, etc:; that I feel are due to hazardous waste on TI. TURNED DOWN COLD. I spent my life on TI from 1972 to 1980. I have often wondered about the health effects from living there, playing there, going to school there…this is so scary. There are certain health issues that I watch closely due to living on that Island. Jesus, who ever would have thought…had my parents known the dangers, I doubt they would have ever had us live there. My Father was dead at 42 after a 20 year career with the Navy. I believe the Navy killed him. How could it not? Cancer does not run in my family and people in my family seem to live too long. 42…dead, and it was an awful death to boot. In addition to that, the Navy almost refused to pay for his funeral services, arguing that they were not responsible and they don’t have to do anything. Really? A Chief Petty Officer who died because of you – a 20 year career (and he would have kept on going if it weren’t for the cancer). It’s unbelievable to me that people live there now…and pay $2k a month to be there. Thank you Navy and thank you TI for keeping all of us safe! I lived on that island in the early 70’s I’m a male who has had Brest cancer and other issues. I played in those areas as a young man and now I’m paying the price. Thanks US government for all you have done for me. Served and lived on Treasure Island in 1957-58 as a member of US Navy for 8 months. Another 8 months on Treasure Island in 1964 as a member of US Navy. MRI on Brain accomplished in 2011 due to losing sight in left eye. Results of MRI—Large Brain Tumor sitting on top of Brain but not in Brain itself. Doctor said it could have been there since Birth. Info on TI just discovered this week. Could my Brain Tumor be as a result of my US Navy Service On Treasure Island? Who and What are the Experts in California on this subject? Doctors/Lawyers with specialized Practice? I have no clue—Vietnam Vet in Texas. Husband stationed on TI 1970-1971. Developed leukemia in 1973, then sarcoma, then hyperthyroid. Doctor’s asked if he had been exposed to radiation. My family and I lived on TI for four years in the early 70s and another four years in the early 80s. We have all suffered many different unexplained medical conditions including; Cancer, Auto Immune Diseases, Bleeding Disorders, Thyroid Problems, Eye Problems, and so on. Of myself and my three siblings, every one of us has had a child or children with birth defects or in my brother’s case, deformities that caused death before the birth,and other health issues. We lived right in the middle of one of the marked contamination areas on Gateview Ave both times, we played in the field and the park next to the school. My older siblings attended that school. We hung out in those buildings that were turned into things like the bowling alley, youth center, teen club, skating rink,swam in the pool,swam at the beach (Clipper Cove), ate the fish, crabs, muscles etc that we caught. Played soccer and little league in those contaminated fields. So what now? Now that we all have this info, what do we do?? We lived on YBI from 72-76 but I did attend third grade at the very school in the article. Then, when our elementary school in the city was being earthquake-proofed, I went to 6th grade on TI in an old office building. Who knows what I was exposed to. Of course we were on TI all the time for church, commissary, exchange, swimming pool, movies, etc. I have many great memories of both islands, but this is really scary. I hope everyone whose health has been affected by this obvious problem is given justice. and that is where the school bus stop is located and children play all over that apparently green pasture like if it was nature’s wonderland!!!! Editor’s Note: The information below compares 1. the radiation exposures to the whole body which are the established federal standard for various activities 2. amounts of natural background radiation; 3. common sources of additional radiation; 4. amounts from medical treatment (very high radiation to a limited part of the body), and 5. amounts from diagnostic research (low levels from radioactive tracer elements). The source of this information is Francis Masse, director of the MIT Radiation Protection Office. Dr. Masse is a past president of the Health Physics Society and served in 1987-89 as chairman of the National Academy of Sciences panel which reviewed the exposure of soldiers to radiation from atmospheric testing in the 1940s and 1950s. The highest recommended limit for radiation exposures is for astronauts-25,000 millirems per Space Shuttle mission, principally from cosmic rays. This amount is beyond the average 300+ millirems of natural sources of radiation and any medical radiation a person has received. 25,000 millirems per year level was the federal occupational limit during World War II and until about 1950 for radiation workers and soldiers exposed to radiation. The occupational limit became 15,000 millirems per year around 1950. In 1957, the occupational limit was lowered to a maximum of 5,000 millirems per year. The average exposure in the United States, from natural sources of radiation (mostly cosmic radiation and radon), is 300 millirems per year at sea level. Radiation exposure is slightly higher at higher elevations-thus the exposure in Denver averages 400 millirems per year. All of these limits are for the amount of radiation exposure in addition to background radiation and medical radiation. The current federal occupational limit of exposure PER YEAR [!!!] for an adult (the limit for a worker using radiation) is “as low as reasonably achievable; however, not to exceed 5,000 millirems” above the 300+ millirems of natural sources of radiation and any medical radiation. Radiation workers wear badges made of photographic film which indicate the exposure to radiation. Readings typically are taken monthly. 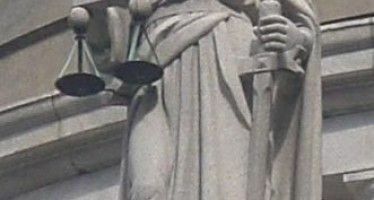 A federal advisory committee recommends that the lifetime exposure be limited to a person’s age multiplied by 1,000 millirems (example: for a 65-year-old person, 65,000 millirems). The maximum permissible exposure for a person under 18 working with radiation is one-tenth the adult limit or not to exceed 500 millirems per year above the 300+ millirems of natural sources, plus medical radiation. This was established in 1957 and reviewed as recently as 1990. I Live On Treasure Island And I Have Two Cancerous Tumors From Over Exposure Of Radiation Since 2004, 12 Years Of Suffering And Not Knowing What Is Causing My Sickness. I Found Out 4 Years Ago It Is Radiation. All Of The Former Naval Dependents Can Sue The NAVY For Violating Our Federally Protected “Right To Know” To Know About The Enviroment In Which We Live. This Is A NAVY Pandora Box Cash Cow. My Family And I Have Retained An Attorney To Sue The BeJesus Out Of The NAVY And Five Other Defendants. This Is A Major Fraudulent HUD Cover-Up. I lived there from 2006 to 2009, I was pregnant in 2007 so I lived there through my entire pregnancy, my son was born with half a heart and a very unusual heart structure and has had to have three surgeries. If there is ever a class action lawsuit I want to know about it! Please contact me if you hear of any. We lived on TI in 1983 thru 1984. MY son was 1 – 3. He was diagnosed in 2012 with osteoporosis. After both hips were broken. No accidents, falls, etc. Also has thyroid problems. Osteoporosis diagnosed at age 30. PROBLEM HERE??? Was stationed on TI in 70-71 and came down with CLL in 2004 and AML in 2010. Found this article on this subject during some of my research. As I am very interested, I would appreciate any further information or updates on this topic. Hi I see you have a Radiation Illness too. My wife and I have been researching the information on the Island. We have been looking for those who were stationed here, it seems that those that were in the Navy and stationed here have associated their illnesses to this base. I was there in 1966 I would be interested in hearing from you. Were you stationed there and did you file any claims? My is Felita Sample and my daughter and I live on Treasure Island. We are both sick and I have stomach pain and my kidneys always hurt. I vomit everyday. My daughter she has a Radiation rash that will not go away. The cityof San Francisco will not transfer me. I live under HUD Shelter Plus care and they know about the Radiation and all the toxics on Treasure Island and in the ground. They say Radiation is safe. Radiation and the toxins are never safe. These toxics are known to cause cancer. People get sick from cancer and they suffer and then they die. How cruel can San Francisco be. We lived on TI from 92-95. On Gateview Dr. Our four children played in the park, soccer and ball fields and went to school there. I have had Non Hodgkin Lymphoma. Two of our sons have come down with unusual food allergy issues involving their esophagus. Both of our grandchildren were born with allergies to almost everything. We kept asking where is all of this coming from?? Now I think it is from living in toxic and radiological waste. I am going to make sure all of my kids show their doctors this information. I just learned of it. It literally sickens me. I feel the Navy should pay every family it exposed. It will take a class action lawsuit.I also have medical problems. According to a source most vets who served on TI are dead.